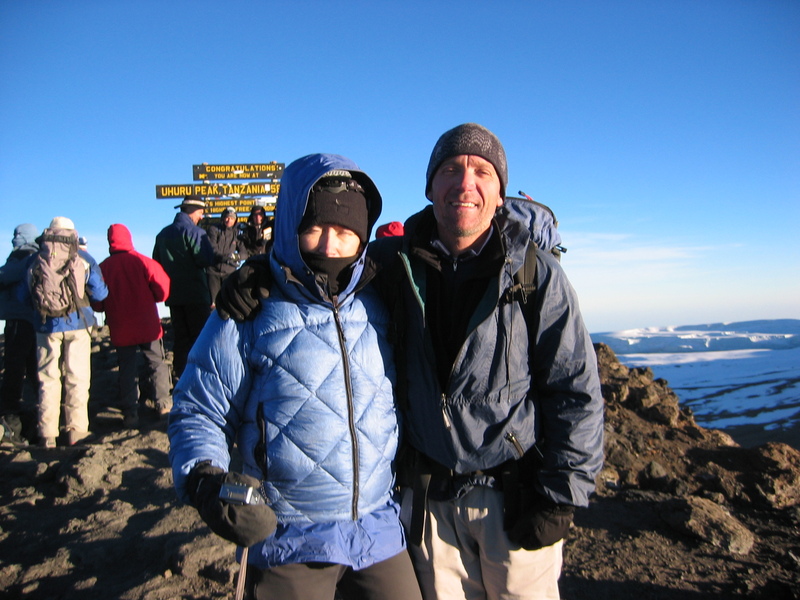 Team Kili Olympics summits a windy and snowy Kilimanjaro! Hello everyone, this is Ben calling in with Team Kili Olympics here on Kilimanjaro. We are doing fantastic. We are down at Millennium Camp (which is about 12,400 feet). We had a very successful summit day today. We had some wild weather up there today, but very successful in the end. We started off with just a few clouds in the sky as we started out. It was a full moon night; it was a very peaceful full moon. And as we went up some more clouds came up and over from the north side of the mountain, over the mountain. We ended up getting some snow, some winds which picked up as we got higher up on the mountain. Up towards the summit was kind of a whiteout, and very blizzard-like conditions up there. So it was very challenging conditions to get up to the summit today. But we had eleven out of thirteen people get to the summit today which was fantastic. Just had a couple people turn around, just about three quarters of the way up (just over 18,000 feet) and they did a fantastic job getting up there and decided to turn around there. Everybody’s good though, everybody’s healthy. We’re back down here. It feels good to be breathing in some more oxygen in the air at 12,000 feet. And we just finished up dinner and we’re heading off to bed here. We have an early rise tomorrow morning so we can get down the mountain. We still have about five hours of hiking to do tomorrow to get to the trailhead. We’ll have a nice buffet lunch to celebrate our time on the mountain here and then we’ll head back to Arusha. We’ll be checking in to the Arusha Hotel tomorrow afternoon and go out for a celebratory dinner tomorrow night. Everybody’s doing great, says “hello” to everybody following along. Everybody’s pretty excited with the accomplishment of getting as high as they did today and a lot of people getting to the summit. It’s an exhausting day today. We’ve been on our feet for a long time, since midnight. It’s now about 7:45pm here, so we’re just now getting to bed which feels pretty good to lay down. Thanks for following along. We’ll talk to you soon. Bye.